In 1919 the Treaty of Versailles had banned Germany from possessing an air force, but in 1935 Hitler announced the formation of the Luftwaffe, and by the outbreak of war in 1939 it boasted over 4,000 frontline combat aircraft and was the most formidable air force in the world. This was the last Airfix set of pilots and ground crew. Since these figures were primarily aimed at accompanying aircraft most are of ground crew performing various tasks. Some are refuelling or loading ammunition, and others are performing maintenance. The last figure in the top row holds what looks like a tray of cannon ammunition, and another has a belt of ammunition for machine guns. The figure on the end of the second row is holding a paint sprayer, and the fourth man in the bottom row looks to be holding the barrel of a large-calibre cannon such as the BK3,7. One of the pilots is running in an unconvincing pose, but apart from that they all look natural and reasonable. The ground crew mostly wear overalls, which is correct, with the only difference being in headwear. Many are wearing the flyers cap (or the identical drill cap), but some are wearing the mountain cap or the later M1943 universal field cap, so they are appropriate for all periods of the war. Figure one on the third row, who seems to be refuelling, wears a pair of goggles, but apparently no other protective clothing. The two pilots are both wearing the one-piece flight suit with the concealed diagonal zip-fastener that was standard issue at the start of the war. However by 1942 production of these had ceased and two-piece suits became the norm, so these men are for the early war period. In all respects the clothing is well done and accurately moulded. Airfix were routinely producing good quality sets at this time, and this is another fine example. The detail is well done, with realistic folds in the clothing and nicely done tools and ammunition. 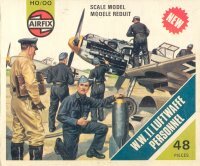 We found very little flash on our examples, though as always other batches may be different as even this late Airfix set is decades old now and has been much reissued. There is no assembly, and the figures have been designed so as to avoid excess plastic, yet largely avoid looking flat (with a couple of notable exceptions). There are no complaints about accuracy, and none about the quality of the mould. Air force personnel may not make the most exciting subject for a set of figures, but this is a good collection that serves its purpose well, and as a bonus there are other possibilities for these figures in areas such as tank and vehicle maintenance, since their generic overalls and German caps are applicable to many arms.